Roaming the scene for 25 years, Aura Noir has become an institution amongst the bands attributed to the black/thrash moniker. Since the start, the band has always strayed their comparatively unique path amongst their contemporaries. Where other masters of the craft, like Nifelheim and Desaster, lean towards the blackened side, Aura Noir nods towards a thrashier approach. Particularly noteworthy is the vibrant punk nerve within the Aura Noir sound showcasing the influences brought by Motörhead into thrash metal and Venom into black metal. If one compares Aura Noir's 1996 debut 'Black Thrash Attack' to the fresh effort 'Aura Noire' the spotting differences lies in 22 years of progression in production. On this nigh self-titled album there is no intricate songcrafting and no technical instrumental endevours, but raw, filthy uncompromising blackened thrash metal. More than this is frankly not desired. Aura Noir has always been an embodiment of attitude and spite, laden with a thick odour of late stage decay. Within this well-defined, yet narrow, pandemonium, intricacy and grandeur has no place. 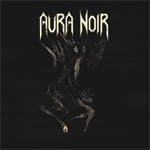 Looking at the quality of the individual songs, 'Aura Noire' is your typical Aura Noir album: solid, headbanging-friendly and crafted for a live setting on the dampest, darkest most intimate scene available. In short, fans of the band know what to expect and will surely be satisfied. For newcomers, this album is as good as any to enter the Aura Noir pandemonium.